One of my favourite things to browse on the web (not least Pinterest) are all those wonderful ideas for upcycling or repurposing objects which no longer serve their original purpose for one reason or another. Much better to re-use than to throw these things away. Just before we relocated to Greece, I had wanted to bring a few things with me that reminded me of home. These translated into numerous kitchen items, but also a quilted coverlet made from patches of cloth I had collected over time. These rags were once parts of shirts, skirts, jeans, decorative pillow covers, tea towels, napkins, curtains, cloth left over from recovering dining room chairs, etc. Actually, any fabric that caught my attention was thrown into the pile. 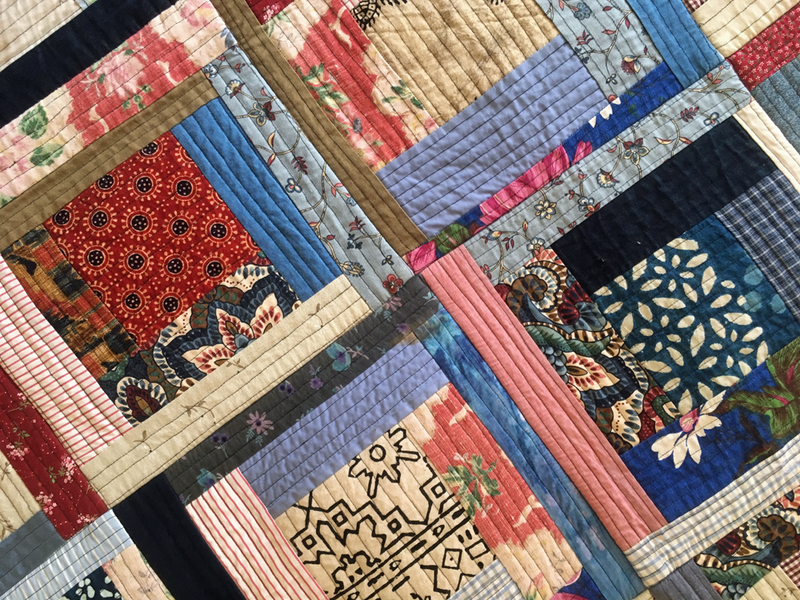 Not really being a quilter, I turned to a method sometimes referred to as a log cabin quilt – billed as a foolproof method for beginners. Simply, each square of batting is stitched with scraps starting in the centre and radiating out until you get to the edge of the square. Each square alternates between a light centre (ending in a dark periphery) and the reverse. When you have enough squares, they are cut to a standard size and stitched together (alternating your light-dark centres) into strips and then the strips are sewn together. A backing cloth (a large sheet will do) is attached and sewn on and edged. Voilá! Repurpose: The Daily Post’s Weekly Photo Challenge. with this year’s cooler Athenian winter. Well done! We call it a biographical object (archaeological jargon), but a quilt diary sounds much nicer and more personal. The weather is much colder this year, so it has come in handy! It took 2 months to make! Beautiful, and how clever! I think of all the stories and memories quilted there. An heirloom now. The stories bound into the quilt are the best thing about it. It is not exactly perfect as my sewing skills are limited, but I was pleased with the overall effect. 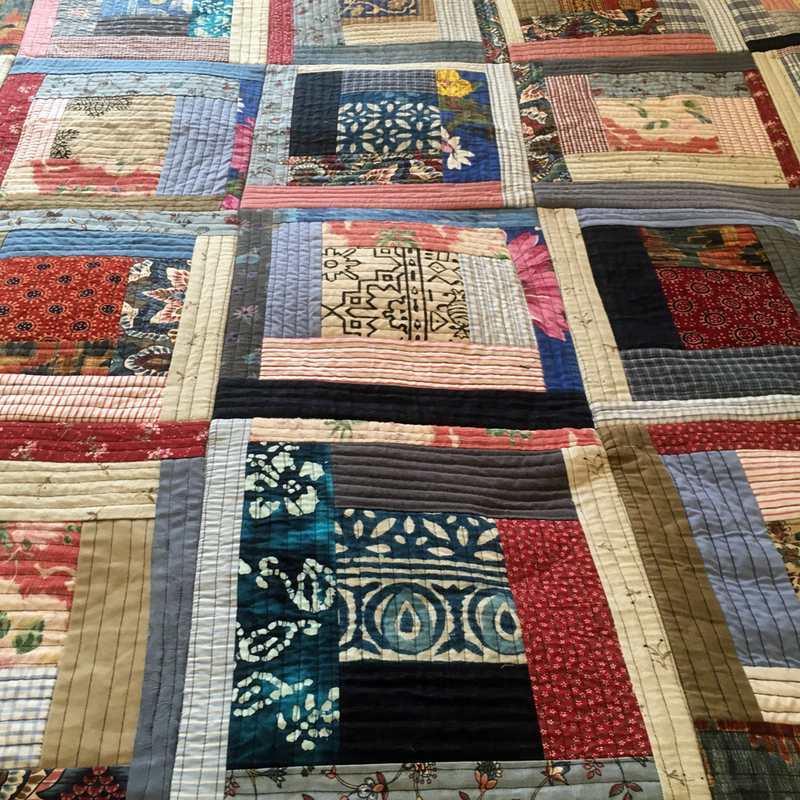 I am a sewer too but don’t have the patience for patchwork and quilting, however I love the sentimental value of using fabric scraps this way. I guess I would’t call myself a sewer either. I can just about do straight lines. I’ve thought about using this technique for smaller things like placemats, so patience not really required! And, I disagree – you must have had infinite patience as well as loads of sewing talent to produce that beautiful wedding gown. Well, to call me a sewer is a bit of a stretch. I can do straight seams (just about) and sew on the odd button or two. It only goes to show that anyone can make something wonderful with a few scraps of cloth! Very nice…I am impressed, especially in that this is your first effort.I never would have known! I missed this gorgeous post and now just found it through your kicthen post. Lovely. Homemade, definitely, and we certainly like it. But, why is it that when you do something crafty, you can see all the little flaws? When I look at other people’s crafts, they just look perfect! Perfect is not high up on my list. There is beauty in imperfection.